The Coach House is a spacious barn conversion with 4 bedrooms all en suite + sofa bed. Two bedrooms are located on the ground floor; one twin and one double bedroom and bathroom suitable for visitors with mobility difficulties. Upstairs is another double bedroom and twin bedroom. There is also a sofa bed on the gallery landing. Set within its own grounds there is ample parking, a lawn and barbecue area with large wooden table and seating for 10. The Coach House also has its own laundry room with washing machine, tumble dryer, additional fridge and freezer. There is plenty of secure storage room for golf clubs, bikes etc. The Coach House has digital TV, DVD player and wireless internet connection. We can provide cots, high chairs and stair gates free of charge. The Coach House is well furnished and equipped with everything needed for a relaxing and enjoyable stay. 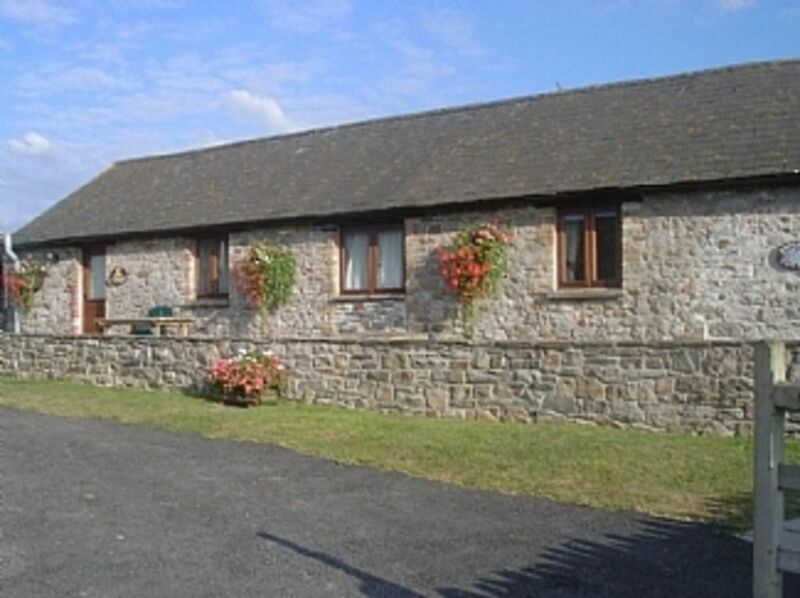 Tytanglwyst Farm Holiday Cottages are located on a working family farm near the South Wales coast. There is easy access to the M4, making Tytanglwyst Farm accessible and yet tucked away in the countryside. Swallow Cottage is our smallest. The cottages have character with whitewashed walls and exposed beams. All cottages are fully equipped and furnished to a high standard. Wireless Internet connection is freely available. Bed linen and towels are provided. Each cottage has a cosy wood burning fire. Visitors are welcome to enjoy the experience of visiting a real farm, see the cows being milked and visit our stables. The cottages can accommodate from 2 to 8 people + sofa beds. Cots, high chairs and stair gates can be provided. John & Liz Lougher & Family have farmed at Tyanglwyst, a working dairy farm just 3 miles from the South Wales coast, for many years. Our four character cottages have been tastefully and carefully converted from stone farm buildings offering a warm welcome to visitors. Ours is a proper working farm and we encourage visitors to experience a real farm, see the cows being milked and help with feeding young calves. We hope that visitors will enjoy a walk through our ancient woodland. All of our award winning farm milk is processed and bottled on farm. Visitors can enjoy tasting our milk, cream and butter as they relax in our characterful cottages. See the you tube clip on our web site for more information about us. Tytanglwyst Farm is just 3 miles from the beautiful Wales Coastal path and Glamorgan Heritage coast and only an hour's drive away from the Brecon Beacons. There is easy access to the M4 making Tytanglwyst an ideal base for visiting the numerous places of interest in South Wales. Located midway and an easy half hour drive from Cardiff and Swansea with so much to see and do. Yet - Tytanglwyst Farm is tucked away - a haven for relaxation. Visitor can be active with excellent golf courses, pony trekking, walking, cycling, surfing, go karting and various other activities. There is plenty to do! This area also has castles, museums, nature reserves, lovely villages, country parks and pubs, good restaurants and shopping. A stay at Tytanglwyst Farm can be as active or as relaxing as you wish. Our barns have been sympathetically converted using traditional Welsh materials. Enjoy the cosy wood burning fires and admire the exposed beams, whitewashed walls and flagstone floors. A mix of traditional with all mod cons makes for an enjoyable break at anytime of the year. Our 4 cottages are situated together - ideal for a family or friends get together. toilet, combination tub/shower, Shower attachment on bath taps. The Coach House has its own laundry room. Free Wi Fi and Broadband. Bath sheet and hand towel per person provided. Tea towels also provided. Three two seater sofas in living area plus window seat. Gallery landing also has sofa and armchair. Built in kitchen fridge but additional fridge and freezer in utility room. Our farm milk in fridge. Butter, eggs and cream available from our dairy. We provide welcome pack of tea, coffee, hot chocolate sachets and Welsh cakes. Bottele of wine for returning customers! Small dining area adjoins kitchen/living area. . Large table has 6 chairs + two stools. Some videos/DVDs available to borrow. Small lawn with patio and gravel area. Patio with large table and 12 chairs for outside dining. Bridgend Golf - Practice Driving Range and public 9 hole course. The Royal Porthcawl 3-4 miles. Pyle and Kenfig 2-3 miles. The Grove 1 mile. Southerndown 6 miles. Please see access statement on our web site or contact us directly for details. Notes on accommodation: All cottages have oil central heating as well as wood burning stoves. We regret that pets are not allowed as Tytanglwyst is a working farm. Smoking is not permitted inside the cottages. The Coach House and Granary have full size cots but we also have travel cots, high chairs and stair gates available. All bed linen and towels are provided. The Coach House has its own laundry facilities. The Granary , Ivy Cottage and Swallow Cottage have a shared laundry room. Outside: All four cottages have their own patio with wooden table and seating. The Coach House and Granary have lawns and inbuilt barbecues. Ivy and Swallow Cottages have mobile barbecues. Ivy and Swallow Cottages are adjoining. There is ample parking and visitors are welcome to walk around and enjoy the farm. We had a wonderful week staying in the delightful Coach House. A warm welcome from Liz and John and a few welcoming goodies too, such a lovely touch. The farm's own dairy produce is delicious, the milk is so creamy, and the butter is like gold dust, sells out fast. The property ticked all the boxes for us, all 4 bedrooms have en-suite bathrooms, 2 upstairs and 2 downstairs, one of which is a wet room with mobility aids, absolutely ideal for my elderly mother of 94! There's ample fridge and freezer space, with spare fridge freezer in utility room. We loved being on a working Dairy Farm, John so kindly delivered a running commentary while watching the milking, it made it very interesting, and a lovely young man showed us the calves and explained all about them too. Despite having an unsettled week, weather wise, we loved the coastline and surrounding little villages, our week went fast, would have loved to stay longer. Thank you Liz & John for making us feel so at home! Thank you so much for your positive review. We are delighted that you enjoyed your stay at Tytanglwyst Holiday Cottages. It was a pleasure to welcome you and your family. So pleased too that you enjoyed the farm experience and our award winning dairy produce. The Glamorgan Heritage Coast is a lovely area and I'm sure there will be lots more to explore on your next visit! we were able to look and help around the farm, buy our orange juice, their own milk and butter. The accommodation was very clean and it had everything to cater to your needs. beaches, shops and pubs all near by. Thank you for a great weekend. The kids loved the whole farm. The walks and the dairy farm tour. The milk house was great. Loved the cottage. What a lovely place to stay, plenty of room in the accommodation for a family get together. Easy access to main M4 motorway for tourist attractions, main cities and close to the coast at Porthcawl. Loved the wildlife and of course the cows which allow the farm to produce excellent milk and butter. Can recommend and would visit again, owners could not be more helpful. As part of the Wales Coastal Path, The Glamorgan Heritage coastline is a beautiful and varied coast. Our nearest beaches are at the seaside town of Porthcawl just 3- 4 miles away. Here you will find a marina, sandy and rocky beaches. A popular place for surfers. The farm is located just a few minutes drive from junction 37 of the M4 midway between Cardiff and Swansea. Caridff Wales Airport is about 45 minutes drive. Bridgend - 6 miles away - has a main line railway station. A car is probably needed but there are also plenty of taxis and buses in the area. Porthcawl seaside town 3 miles. Mc Arthur Glenn shopping outlet 10 minutes. Cardiff 30 minutes drive. Swansea 30 minutes drive. Brecon Beacons one hour drive. Several golf courses and country parks within 20-30 minutes drive. The Brecon Beacons one hour drive. Most major supermarkets are nearby and will do a home delivery ready for your arrival. Our nearest town is Portchawl although the local village has a small supermarket, Pharmacy, petrol station, cash point etc. Booking Notes: Please contact us for a definite price. We require a £100 deposit on booking - payment by cheque, credit card or bank transfer - the balance being due four weeks prior to the visit during peak holiday times. At other times of year the final balance can be settled on arrival. Please see terms and conditions on our web site. Changeover Day: Peak holiday times - Saturday to Saturday. Departure usually 10 am. Arrival after 2pm. However -we can be flexible. Notes on prices: Please contact us for a firm price. Discounts available for bookings of more than one cottage. Short breaks either mid week or weekends are available out of peak season - a minimum of 2 nights. Please email or phone for details.